Rio Grande City High School senior, Katherine Trevino, signs a Letter of Intent to attend the University of Texas A&M Kingsville. Her scholarship will cover all tuition and housing for four years. She has been a stand out athlete in Cross Country and has many accolades under her belt. 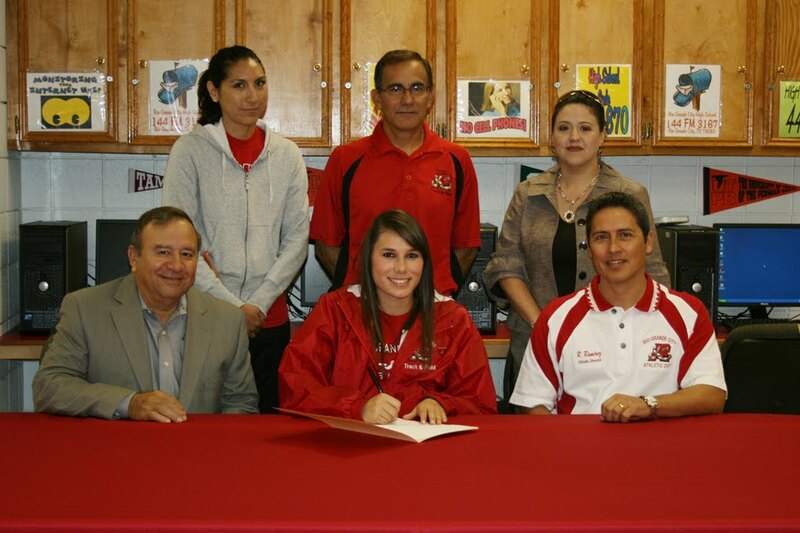 Trevino was a Regional Qualifier in the 400 meter dash, 1600 meter relay and made All District Team in Track and Field her freshman year. Her sophomore year she also was a Regional Qualifier in the 400 meter dash, 1600 meter relay, State Qualifier, All District First Team and All Valley First Team. Trevino was a Regional Qualifier in Cross Country and also led the team to qualify for the Regional Meet. Trevino last and final Track and Field season is underway but is expected to perform extremely well. Pictured left to right are; Sitting- Jorge Recio (RGC High School Principal), Katherine Trevino, and Rey Ramirez (Athletic Director). Standing- Ana Cortinas (Coach), Ricardo Altahif (Coach) and Roxanne Garza (College and Career AAdviser. RGCCISD photo.